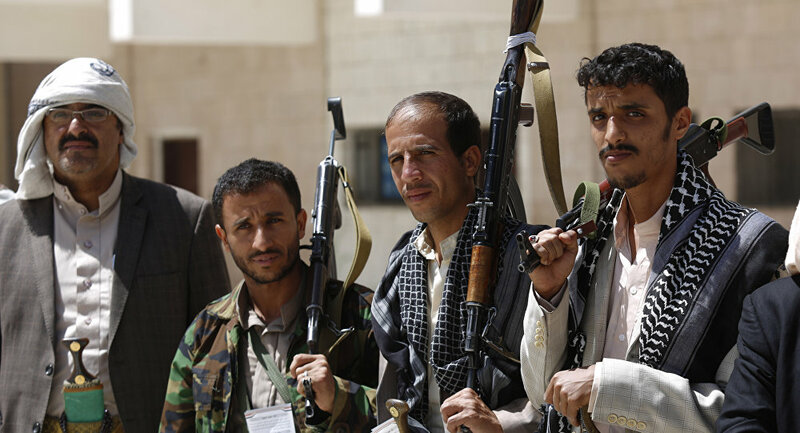 The Saudi, Emirati Yemen governments sent a joint letter on Tuesday calling upon the UN Security Council to pressure Houthis and Iran into putting an end to obstruction of the political pact to stop the 4-year war in Yemen. The Houthi group earns lavish income from its control over goods inflow into the rebel-held areas, said the letter. The Yemeni capital of Sana'a, most populated areas in the northand the RedSea port city of Hodeida,along with state institutions, commercial banks and telecommunication firms have been under Houthi control. A UN panel tasked with monitoring of sanctions on Yemensaidlast January, in its 2018 report, that Houthis received at least US$ 300 million a year in revenues of fuel shipped from Iran's ports to fund their war against the Saudi-backed official government of Hadi. The joint letter, carried by the Saudi Al-Arabiya TV, accused Houthis of denyingYemeni access to aid, claiming that the Yemeni, Saudi and Emirati have documented the Houthi "thefts" of relief supplies. This has dissuaded coalition states from delivering humanitarian donations lest Houthis seize them, said the letter. On 31st of last December, the United Nations' WFP directly accused Houthi rebels of fraud and thieving food aid intended for millions of Yemeni people in need and selling them at markets in rebel-held provinces and cities in north of the country. Emirati, Saudi and Yemeni governments reiterated their commitment to political solution for Yemen conflict and their support to the UN envoy mission, particularly in terms of Stockholm deal application. The conflict has lefttens of thousands killed, hundreds of thousands injured, and 3 million displaced, triggering what the UN calls the world's worst humanitarian crisis, with most of the population in need for a type of humanitarian aid and immediate protection, including 14 million people risking famine and some 1.8 million children suffering malnutrition.